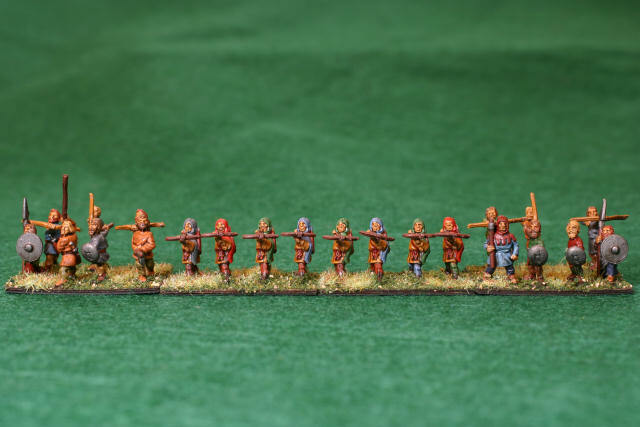 This article shows a miniature army in 15mm scale painted andbased for the miniatures game De Bellis Antiquitatis .Each army consists of 12 stands (known in the game as elements) of 2 to 4 figures per stand.The IV/30 Teutonic Order Army representswarriors of 1201 A.D. to 1522 A.D. who lived and fought in the Prussianarea of what is now Germany and Poland.Their history is fascinating.They were invited to settle this area by the Pope.They fought the local inhabitants, the indigenous peopleof Prussia.At various times they allied or fought with the Polesand another religious order to the north,the Sword Brothers, of what is now Estonia.The Teutonic Knights are well known from moviessuch as Sergei M. Eisenstein's Alexander Nevsky (1938),and also being the model for the Chaos Warriorknights of modern Games Workshop games. 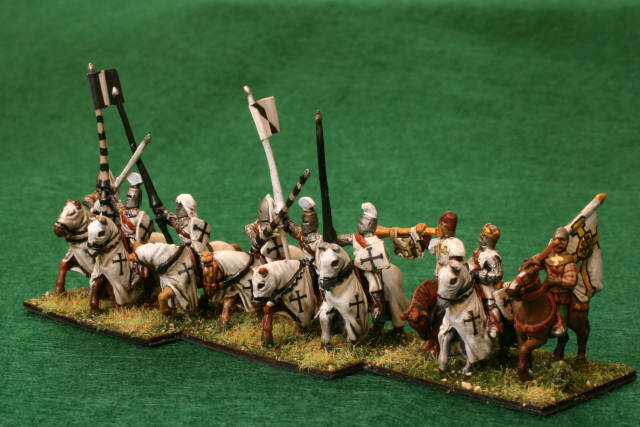 The Teutonic Order army has one variant with a few options. 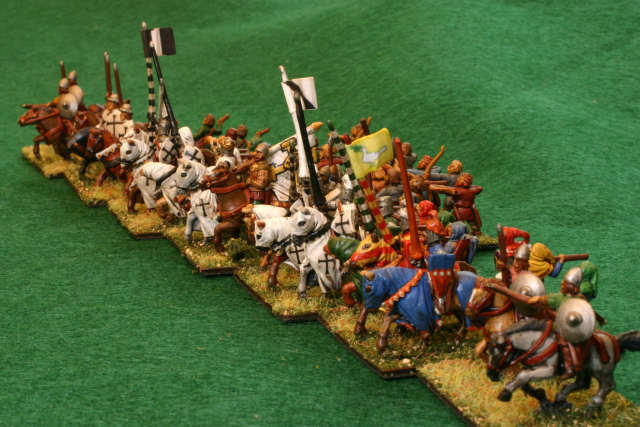 They areone of the most aggressive armies in DBA with an aggression of 4. To the right we see a photo of the King or Grand Master knights with flag and trumpeter.Accompanying are two stands of order knights.They have white surcoats, steel pot helmets,and long lances. 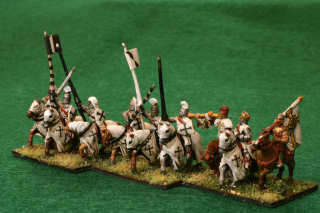 I painted the knights in my usual manner with Vallejo Acrylic paints.The bases are thin plywood from Litko Aerosystemswith flexible magnetic sheeting below to adhere them to their metal-lined. carrying case.Grass consists of flock and static grass from Woodland Scenics. As usual, to get shading of the deep recesses, I dipped my completed models inMinwax Polyshades Jacobean polyurethane.This is dark colored, inky wood stain in a plasticized clear varnish.Although I usually like the shading effect, I did not like the results onthe white surcoats and the brightly colored questing knights.Although you can remove wet varnish with a cotton swap, it still left myknights looking a little dirty and battleworn.Battleworn is great for the foot soldiers, I would rather havethe knights look clean and god-like.Next time I will be sure to remove more of the varnish tokeep the knights looking clean and guarderobe-fresh. To the right is are the questing knights, some ordinary cavalry, and two stands of light horse.Teutonic Knights often invited nobles from England and France to join in the battleagainst the heathen.Here are three of them with their brightly colored coats and lances.Knights used bright colors to let the other side identify them on the battlefield.It was considered beneath their station to fight the rabble, and hence they worethe most outlandish garb so they could meet each other in single combat.My colors are not historical. In fact I choose one to match my wife's favorite football team. 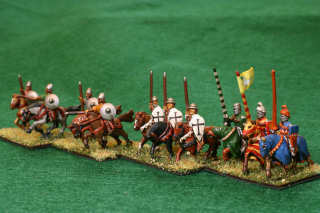 Notice the crosses on the cavalry shields and the knights from the previous photos.Rather than hand paint these crosses, I made decals with my home computer.Simply find an image (color or black and white) or draw one with a computer paint program.Instead of printing on regular paper, print on water slide decal papersuch as available from Bel Inc..After printing on the decal paper, ink jet ink is water-soluble, so you must usevarnish the image (with Testor's Dullcote or any other matte varnish) to make the decalwater-proof.Really soak the decal image, as any gap in the clear varnish might cause the ink to run.Then soak the decal in water, and slide onto your model.This technique work with most any scale model.Simply adjust the print to match your model size. To the right is a photo of the auxilia, spears, and psilois.The psiloi and spears are unremarkable, but I really likehow the auxilia turned out.The miniatures have cloth hoods and mantlesknown as snoods in the Middle Ages.They also have rather garrish tunics and stockings.I painted them up and garrishly as I could tooffset the rather conservative looking Teutonic Knights.Now whenever these guys enter battleI yell "BEWARE THE SNOOD WARRIORS! 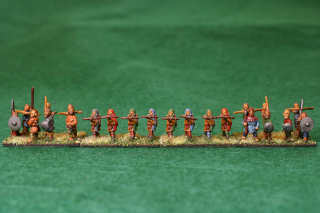 ","SNOOD WARRIORS - FORWARD! 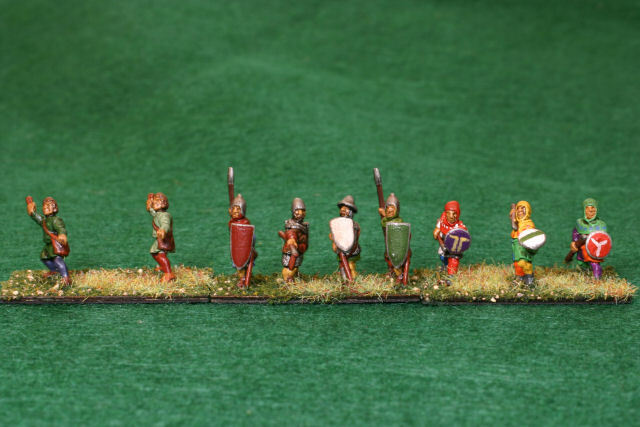 "or "HOW DARE YOU RESIST THE SNOOD WARRIORS! "I don't know why I say this but it often psyches out my opponentwho will always remember the Snood Warriors. My figures are a boxed set from Essex Miniatures. Finally, here are two stands of crossbows and two of horde.The hordes are fun to play.They run and die very quickly,but there are 7 on a stand and they look impressive. So come forward you Poles, Russians, Estonians, Prussians, Mongols, andScandanavians!The Teutonic Order wants to make you repent. Last modified: Thursday, 09-Jun-2011 12:42:11 MST.